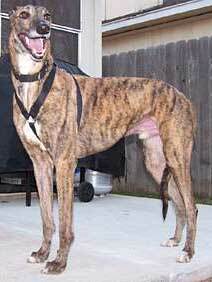 Bugsy is a very, very handsome 3½-year-old brindle male. Bugsy came from the Waco shelter where he was found as a stray. His identity is in the process of being evaluated, as his tattoos are difficult to read. Bugsy arrived with 3 of the tick diseases - Ehrlichia, Babesia and Rocky Mountain Spotted Fever. His medical treatment has been a success, and he is now ready to find his forever home! Bugsy is small animal and cat tolerant. 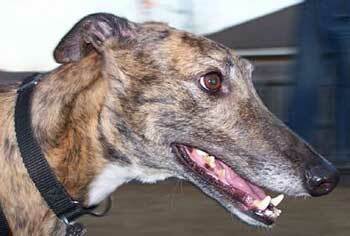 On July 7, 2006, we received the good news from GALT that Bugsy finally passed his tick panel tests. What a wonderful event! Bittersweet for us as we have totally fallen in love with this big beautiful boy! He has been an absolute joy and brings out the playfulness in his foster siblings. Bugsy came into our home in late February 2006, having tested positive with three tick diseases. He was a very frightened little fella who has blossomed into a loving, happy boy. He greets us each day, albeit behind the other Greys, when we arrive through the door and performs a special little dance to let us know he is truly excited to see us! Bugsy needs a very special, patient, and loving mom/dad in a quiet environment with no children. He is extremely timid of people, but once he gets to know you and knows you are there to protect him, he is your best friend and will reward you with generous tail wags, head butts, and lots of kisses. This is something you must earn from him over time. Patience and understanding is the key with Bugsy. Yummy treats always work with him because he so loves food. He prefers to eat alone, so providing him a quiet to area to eat by himself would be his preference. He has very good potty habits, but he had to go through some training to achieve this. However, he has graduated with honors. Like all Greyhounds, Bugsy may need a little re-training in his new environment. Rewarding him will be the best way for him to transition these positive habits to a new home. He is routine oriented, like so many Greyhounds, so letting him out first thing in the morning when he wakes and right after his meals and when you arrive home and before you go to bed will make him a star performer. Bugsy is wonderful at bonding with other dogs, especially Greyhounds, and will need another dog to help show him the ropes, one who is gentle yet confident. Loud noises or raised voices are bothersome for Bugsy, since he is sensitive, so as mentioned above, he will benefit most from a quiet home. Did I mention he loves classical music? He listens to it while we are away at work during the day - makes for a nice, relaxed boy. Yep, this boy has class. He is cat tolerant and would do well in a home with additional dogs and a cat or two. 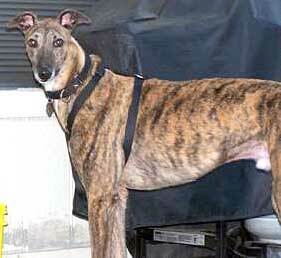 Bugsy loves to run, so his perfect home will have a yard in which he can stretch those long legs for sprinting. This is probably his most favorite activity in the world. He is the quintessential 45-mile-per-hour couch potato! You can always catch Bugsy throwing toys in the air and catching them. He is a hoarder of toys and many times you will see his sleep area full of all his toys. He does not like to be confined and, in fact, will do best in a non-crated situation as this creates stress for him. He does like a crate, however, in which to rest as long as you do not close the door. He sleeps through the night with no problems and lately he has taken to sleeping in with his siblings. Bugsy is not fond of walks where there are other people around because of his timidness, but a quick jaunt down the street and back is not out of the question and he enjoys doing this with his big brother, Logan. To watch Bugsy transform from an extremely timid boy to one who is less shy and gaining confidence, is especially rewarding. I can't say enough about how loving he is. Bugsy's eyes are the mirror to his soul. With his eyes, he will tell you much, if you only look and listen  a true special spirit Bugsy is, and he is looking for that unique home that will help him stretch and grow. I know the perfect home is waiting for him! You can be that special person to instill the confidence that he needs to keep growing emotionally and spiritually. He has allowed us to form a special deep connection with him and we know he can do this with another  Bugsy is that special!